Last month’s Pew Research survey shows that Pope Francis is more popular than ever in the United States. For a country so often defined by its political polarization—even among its Catholics—it’s quite remarkable that a leader of a particular group could garner a 90% approval rating. But for Americans, Pope Francis is not the only beloved Catholic. Strangely enough, a man famous for his sharp political satire boasts his own following that numbers in the millions and boarders on religious craze. He is Stephen Colbert (the “t” is silent), former host of Comedy Central’s The Colbert Report (the “t” in Report is also silent), and future host of The Late Show on CBS set to premiere this September. 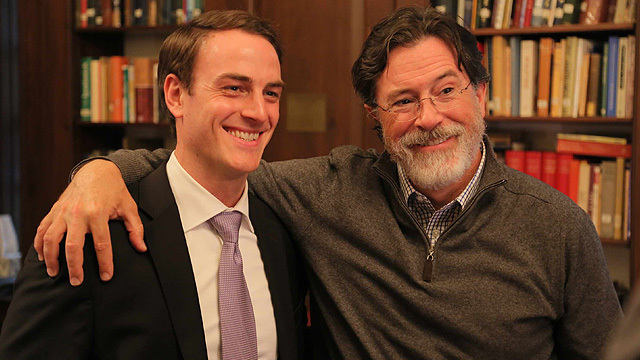 Many Colbert fans, myself included, have been going through withdrawal since The Colbert Report wrapped up last December, and so I was thrilled to learn that Stephen agreed to do a series of interviews with S+L. The big day happened last week. Through our work I’ve met many high-ranking church officials—including the Pope—and some other famous people, but none of those meetings felt quite like this. Colbert is a celebrity, sure, but he is also one of the most skilled comedic minds on the planet; some would put him at the top, and with good reason. 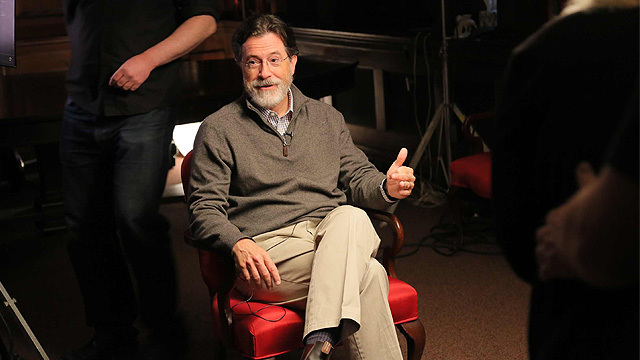 What he accomplished through his character on The Colbert Report was nothing short of brilliant: a powerful mix of creativity, humor and a keen sense of political and social realities in 21st century America. Posing as an archconservative pundit, Colbert exposed the ridiculous inconsistencies and sometimes blatant ignorance of politicians and other news makers of influence. He was even tougher on corporations and ideologies, sparing none when they reared their heads in various ways; even his own faith community became the subject of a few knee-slappers. For all of this we might presume Colbert would be furiously disliked. After all, those archconservatives he was impersonating don’t often respond well to such criticism, hilarious(ly true) as it may be. We can be certain there are a number of American Catholics in that camp too. But the real phenomenon has been the vast number of mainstream, progressive folks who find in Colbert’s wit and charm an amusing escape from the absurdity of political and economic realities in America. Most of them are of a younger generation—students and young professionals—who are sick of politics and disillusioned by the establishment but know the importance of civil engagement and appreciate a 30-minute dose of common sense with a comedic twist each day. The real surprise of it all is that Colbert is a practicing Catholic and it doesn't seem to faze all those fans, most of whom are not particularly religious I presume. By “practicing” I don’t just mean going to church on Sundays. I had the chance to speak with him one-on-one last week and he knows his stuff: quoting Scripture, the Saints, the Catechism and other Magisterial teachings, all springing from a sincere life of faith and a desire to put it into practice. I often wonder what the “Colbert Nation” thinks of their hero who is also Catholic. Some would dismiss it, some would understand it, some might be intrigued by it, others would be confounded by it, and most would simply tolerate it. It’s a fascinating thing, really, to see a person of enormous influence in the popular culture speak openly about his/her religious affiliation—especially a person infused with the two-edged sword of common sense and a sense of humor. I can't help but laugh, and at the same time be impressed by his witness.